Johannesburg - The 29th edition of the Africa Cup of Nations got underway this weekend, when South Africa, as the host nation, opened the tournament with a dull 0-0 draw against Cape Verde. According to the soccerladuma.co.za website, Bafana Bafana failed to live up to expectations at the National Stadium in Soweto, Johannesburg, in what was a lackluster performance from the entire team. 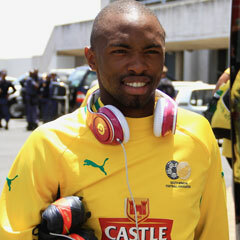 Striker Bernard Parker admits that the team played below standard and that they will need to improve on their performance when they face Angola on Wednesday at the Moses Mabhida Stadium in Durban. The Kaizer Chiefs and current PSL top goal scorer said that the players were nervous going into the opening game, however says that they need to settle and play their normal game against the Angolans. "I think we were nervous. We should improve and do much better against Angola. We should play our normal game and attack the opposition. We didn't do that against Cape Verde on Saturday and it didn't help us. “If we can play our normal game as a team on Wednesday we have the chance to win the game and that's what we want to do. We have to improve our performance," Parker concluded.